Karen was recommended to me for her excellent technical and communication skills and she didn’t disappoint. Although we talked only on the phone, she understood exactly what I wanted done with my website, and also made some excellent suggestions, which she carried out quickly and efficiently. She gave me extremely clear and helpful advice on how to add content to my WordPress site, and also on how to improve my online presence. I, in turn, would recommend her unreservedly. I am a mature student with the Open College of the Arts, studying Textiles. This is a distance learning course and a WordPress.com is a key component in the course work and assessment. I was able to set up the site following the instructions from the course, but I found some of the details of the WordPress structure confusing, which became stressful. I had a one hour face to face session with Karen that really helped me move forward in putting the pieces into place. Having someone to point me to where things were in the dashboard and explain the ins and outs of the menus, and widgets, rather than trying to work it out on top of all of the other elements of studying the course, saved me a lot of time. I was able to put my new skills straight into practice and re-arrange my blog the way I wanted it. Karen is a patient and calm teacher. I am a textile artist, amongst other creative areas of work. Karen has helped me to set up a free WordPress.com website/blog and buy a domain name that forwards to it. She set up the initial free WordPress theme. I have control over the content and can go to her for advice if I am unsure of anything about the set up. She also set up my facebook page for me and Twitter account and has helped me to gradually build up the following on Twitter to over 1,500 people who are interested in textile art and who are local to my area. The best thing was she got me interested in Instagram, so I can take quick phone pictures of my work in progress and post them instantly. I love the immediacy of that. She is very knowledgeable about the technicalities of these things, but is also able to explain patiently in terms that non technical people with perhaps a little techno resistance can understand. I am a painter and sculptor. I have a studio in Barmouth, St Johns Hall Gallery, that is open 7 days a week all year. Karen has been helping the gallery with online marketing. She talked to me initially about moving over from an HTML website to a free WordPress.com site. With a couple of initial demonstration sessions, I was able to set up the site, and we have worked together on it since then, with me mostly posting the content and Karen tweaking things from time to time. She has also been promoting the gallery via Twitter and is one of the people posting to the gallery’s facebook page. She helps out with the gallery’s YouTube channel where I post videos of people who come to visit the gallery. Karen has a wide range of knowledge and experience of online technology and has an eye for detail. Karen keeps up to date with the rapidly changing web/social media environment and has been a valuable sounding board to test ideas and rapidly quash those which have no hope. I have adopted bespoke free wordpress sites for many site-specific projects and her guidance has helped a previously non-existent social media strategy emerge. Recommended: she listens and communicates clearly and concisely. Her web blog is a mine of free information. Make time to read it – it will give you an entreé into what you can benefit from through further engaging her skills. I am a performance poet. My income comes mostly from leading workshops in schools with some sales of my own books and fees and royalties for poems in many anthologies. Karen helps me with all of my social media presence. She redesigned my WordPress.com blog and has implemented strategies of blog posting that has increased my hits. She also manages my Twitter account, Facebook page, YouTube channel, Google+ page and has recorded me playing my own compositions and turned these into videos that are proving popular. All of these activities have worked together to make my website come higher up in the search engines and has led to enquiries and bookings from schools. Karen has a lot of good ideas that work (I have to say that as she’s my wife). The reviews in this section are a selection that can be seen on my profile page on http://www.peopleperhour.com. 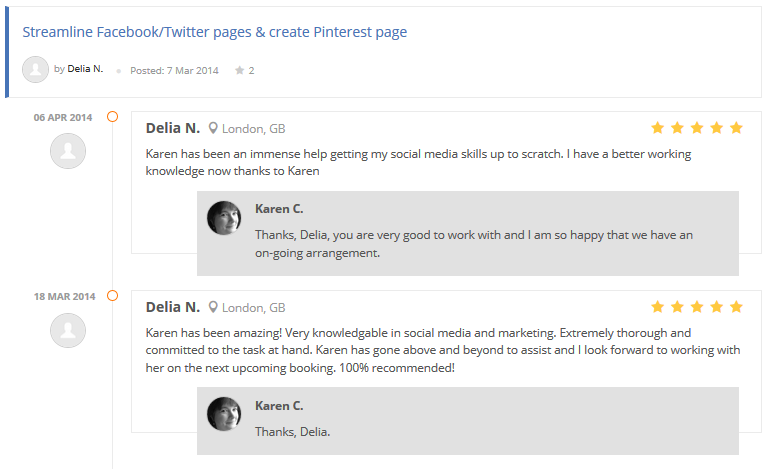 “Karen has been an immense help getting my social media skills up to scratch. I have a better working knowledge now thanks to Karen. If you have found useful advice on this website or any I have given elsewhere, please feel free to add your own testimonials in the comments on this page. Thanks.